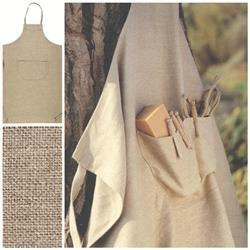 An apron perfect for kitchen and garden. Available in 2 colors/weight: FLAX (heavy - perfect for garden and barbecue) and LINO (light weight). Both earth tone color. Aprons are generously sized, have a large front pocket and can be easily machine washed!! !